Your credit card will be charged for the full amount of your booking at the time the reservation is made. This payment will be taken via our secure Payment Express Facility. 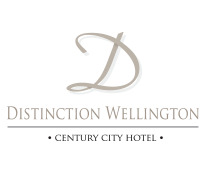 The name that will appear on your statement will be Distinction Wellington Hotel. The guest must present a valid credit card on arrival. A security deposit of $150 per night may be requested on check in & you will be asked to present a valid credit card or photo ID on check in. To stay with us you must be 18 years or older or staying with an adult. You will be asked for photo ID on arrival. An administration fee may be added to any bookings cancelled or amended where applicable. Please note we have a no party no noise policy for the comfort of all guests. Failure to follow this policy will result in eviction from the hotel. Note that we do request that no visitors are received at the hotel after 10pm. No refunds will be given. Note when booking 10 or more rooms group terms and conditions will apply contact us for details. Reserve your parking prior to arrival to avoid disappointment. $20 per night. Email us your request please. No fee to amend your booking (subject to availability). Amendments & cancellations on bookings will be accepted up to 24 hours prior to arrival with no charges. In the case of a no show or a cancellation inside 24 hours, one night’s accommodation will incur and be charged. Where the date is an event period a 7 day cancellation policy applies for Flexi Rates. This includes but is not limited to World of Wearable Arts, Test Rugby, Home Grown, Test Cricket, New Years Eve. Cancellations will be accepted up to 24 hours prior to the day of arrival with no charge, in the case of a no show or cancellation inside the 24 hours one night’s accommodation will be charged. Unused package components are non refundable. Note any packages that include meals are at off site restaurants. Check in time is 3pm at Distinction Wellington Hotel, 70 Tory Street, Wellington. If earlier check in time is required please request this at the time of booking. One child 12 years and under stay free when using existing bedding. Extra children will be charged at the extra person rate. In the event where a rollaway is required the extra person charge will apply. Please note using existing bedding all studio and 1 bedroom apartments have a maximum occupancy of two people. All two bedroom apartments & penthouses have a maximum occupancy of 4 people. Three bedroom penthouses have a maximum occupancy of 6 people. Should you arrive with extra people that cannot be accommodated in the existing bedding in the room you will be required to book an extra room subject to availability. All bedrooms have one queen sized bed unless stated otherwise. Rollaway beds incur an extra fee, these may be requested by calling the hotel directly on +64 4 801 0780. Rollaway beds are subject to availability at the time of booking. One rollaway bed can be accommodated in Superior 1 bedroom, Superior 2 bedroom and Penthouse Apartments. Two bedroom apartments have two queen beds or one queen and two singles on request. Penthouses have one queen bed in each bedroom (one bed in each penthouse can be split into two single beds on request). Baby cots are available on request and subject to availability at the time of booking at no cost.